Capcom cites "manufacturing issues" for the reason behind cancellation. It's an unfortunate situation, one further soured by the impending holidays. Let's be real, the helmet would have made a great gift for your local Proto Man fans. I initially hoped the cancellation was limited to just the Capcom Store, but Entertainment Earth's orders have followed suit. If I hear anything else, I'll let you know. Thanks to AWD for the tip! Capcom was behind on their quota of cancelling Mega Man products. Congratulations dear sir. You have won the comments thread for this article. You know, of all of the Mega Man merchandise announced in recent months, this is the only thing that I would have liked to *not* see cancelled. Couldn't they have cancelled one of the Funko Pops or something instead of this masterpiece? HELMETS are being Cancelled now. WOW! AHAHAHAHAHAHAHAHAHA! "CAM AWN DOOD! YA CANCELING HELMETS NOW?! DIS IS STOOPID!" It's likely because of the fact that the shades just fully failed. But who knows. the helmet got cancelled because Protoman Helmet is too cool to exist in the real world !! our dull world cannot grasp the magnificence of it's true form. They must have figured out that it would not look as cool as expected! so much coolness must be hard to manufacture. al joke aside, i'm quite disapointed, i wanted to get one eventualy. nah, it's just that capcom don't like the idea of too much cool stuff happening. that's why they cancel. so what? i've never heard about someone being allergic to cool stuff. Are they allergic to cool stuff? they woulb be the first case. but that'll explain very well why they don't do more megaman games, since theses are very cool games. No capcom definitly have a problem with cool stuff. It's only a prototype made for tests. And Proto Man didn't aprove Joes taking copies of his helmet. I am unreasonably upset. I was going to use this and the ThinkGeek Blaster (that just got charged for the same day, seems production is done)for my first cosplay, in time for PAX East no less. I have no idea how to put together a good looking helmet from scratch dammit. Wow... you took the words right out of my mouth. I was in the same situation, only difference was a cosplay party instead of PAX East. This would've been my first cosplay too. Just like shayno-mack, I now remember why I cared less and less for Capcom. Of all the things to cancel, this DEFINITELY wasn't the one that should've been cut. It's too late now, I'm planning to wear something totally different. It's sad, because I'm a huge Mega Man fan, but I really can't stand the company he comes from most of the time. Just look at how pitiful X looks in all of the Marvel VS. Capcom Infinite trailers, compared to the other three characters featured, for example. Don't get me wrong, I'm glad he's finally in a crossover. But... they could've made him look like less of a chump at least once. You're not alone in that sentiment. I'm just hoping they ramp it up for him later, but as of now, it's great to see him in action so far. Linker2A03, don't mind it for X and the trailer thing. Sure you see normal X being beaten and all. but hey, that's how X go. remember the intro stage of MMX and the severe beatdown you receive by the hand of Vile? Now remind me how is Vile right now? yeah, he is dead. he is dead 3 time. Capcom is just plaing the base formula. Iron man will probably not die, though. also, they did not show any special move of X in the trailers, contrary to the others. hence why he is far less impressive. probably because they don't have a voice for him yet, they probably think the special move without the exclamation would not be the same. Chill out, X is the damn very first thing seen in this trailer, and he is CONFIRMED as being a important part of the story. and NO even capcom don't give "a important part" to a character while still making him "pitiful". they're dumb, but no that much. This would have been pretty keen for Mega Man's 29th anniversary, but I guess it was not mean to be. I am far too angry at this, Protoman was always and always will be my favorite Megaman character, and I was going to buy one of these to go with the ThinkGeek protoman buster. A damn shame. 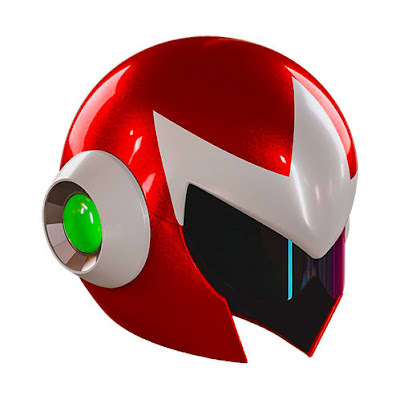 a link to what the final version of the Protoman Helmet looked like...I can see why they called it "Manufaturing Issues".